Michael Olguin: ION Audio is a consumer audio company with a diverse... product line. 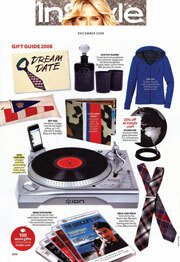 In this case [it was] looking to get widespread media attention during the holidays for [its] LP Dock, a turntable accessory that enables [consumers] to transfer songs from vinyl records to an iPod. What made In Style a good hit? How did you pitch the editors there? Olguin: In Style has a huge – 4.5 million – readership of largely female consumers, which presented both an opportunity and a challenge, since many women-centric outlets don't do a lot of technology coverage. So when we pitched this for In Style's Holiday Gift Guide, we targeted the design editor, stressing how simple the LP Dock is to use, while also noting what a great gift it would make for fathers, husbands, and boyfriends. Did you have to set up any interviews with Ion Audio executives? What other information did you provide to help clinch this placement? Olguin: We didn't have to set up interviews, but we knew this was a cool-looking product, so we sent several LP Docks to the editors along with the press releases. We also worked with them on setting up a promotion so that anyone who went to the special ION Audio Web site set up for In Style would get a 15% discount. Olguin: In Style's December issue dropped right at the beginning of the holiday shopping season and featured a large, eye-catching photo of the LP Dock. ION Audio reported [its] Web site traffic jumped significantly in the weeks leading up to Christmas, in part because of this placement, so [it was] thrilled with our work.